Every Christian’s resisting must have a basis or foundation–so that he can be sure that when he resists evil, God will protect him. Well, God has given us His own set of armor. In Ephesians 6:14-17 we are given a list of the armor pieces. First of all, there is the belt of truth, which girds our waist. Next, there is the breastplate of righteousness, which covers the chest and all the vital organs. Then there are the shoes of peace, described as the preparation of the gospel of peace. In addition to these, we are to take up the shield of faith, by which we will be able to extinguish all the flowing missiles of the evil one. Then there is the helmet, called the helmet of salvation. Last is the sword, called the sword of the Spirit. 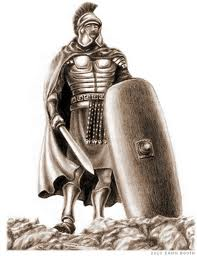 As we ponder these items, we must ask ourselves, “What do these things really represent?” “What really is the armor?” And we must conclude that the armor is the very character of Christ, for the person of Christ, who is God, can be our only source of true protection and strength. Hence, we must not think of the armor as any list of rules or set of beliefs put before us, but a person of supernatural strength that can protect us and go before us. Therefore, as one puts on the belt of truth he is really putting on the protection of the truth of Christ, because Christ is Truth. Likewise, He is Righteous. When I put on the breastplate I am putting on the righteousness of Christ. He is Peace. When I put on the shoes of peace I put on His peace, by which I have peace with God and also the peace of God. He is my Shield of Faith. Note that our faith is not our shield; God, who is the object of our faith, is our shield. As Psalms 5:11-12 states, if we take refuge in Him He will surround us with favor as with a shield. He is my Helmet of Salvation. When I put on the helmet I am really putting on the hope of Christ, which gives me assurance of my salvation. And I am also putting on His protection for my mind—to protect me against all the wrong mental messages Satan feeds me. He is my Sword. When I take up the Sword of the Spirit I take up Christ who is the Word of God. Preparing to resist—putting on the armor. Yes, Christ is our armor, but how do we go about putting on that armor on a daily basis? How does Christ become part of our life, our strength? Is it not by trusting Him? Is it not by seeking Him out each morning in devoted prayer, and by giving our self to daily Bible reading and reflection? Yes it is. Christ will come to us and be strong in us when we submit our self to Him and draw near to Him. Then we have the promise from James 4:7 that the devil will flee from us. And that is certainly true for me. After I have had my quiet time in the morning, consisting of Bible reading, some prayer, and some Bible study and meditation, I feel much stronger in the Lord and less swayed by temptations. I feel that Satan has left the area completely. Then, sometimes, usually in the evening, when I am tired and get lazy, Satan and temptation will sneak in upon me. So, in those times I need to come to the Lord in prayer and meditate on His word again. Yes, we all need a constant supply of the Word and prayer. Joshua 1:8 tells us to meditate on the Word “day and night.” Psalms 1:2 says the same thing. Again in Psalms 119:97, it says, “O how I love thy law! It is my meditation all the day.” Then in Psalms 119:165, it says, “Those who love Thy law have great peace, and nothing causes them to stumble.” And that is because, when we prayerfully meditate on the Word, we are, in a sense, strengthening ourselves with God’s armor, and Satan cannot touch us. But take warning my friend: the armor can be stripped off as easily as it can be put on. As soon as you stop meditating on the Word, as soon as you stop yielding yourself to Him and caring to do His will in obedience, that armor will immediately fall off, and you, as quick as a wink, are exposed to Satan’s cruel attacks and to sin’s evil ploy. So it behooves us to keep in the Word and in prayer—so that the armor is kept in place. Then, in Christ, we will have developed a soldier’s mindset, which is vigilance. With this vigilance we resist the devil, being firm in our faith. This post is an excerpt from my book, Purpose of Prayer. 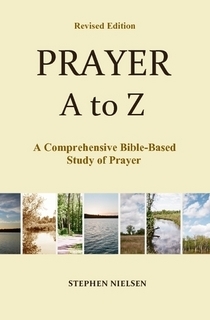 This entry was posted in Prayer A to Z Excerpts, Vigilance in Prayer, Prayer Warfare and tagged belt of truth, breastplate of righteousness, helmet of salvation, shield of faith, shoes of peace, sword of the Spirit. Bookmark the permalink. thank you, Stephen, for sharing this vital Truth with us, to stand firm in the Word and in prayer … Blessings to you!